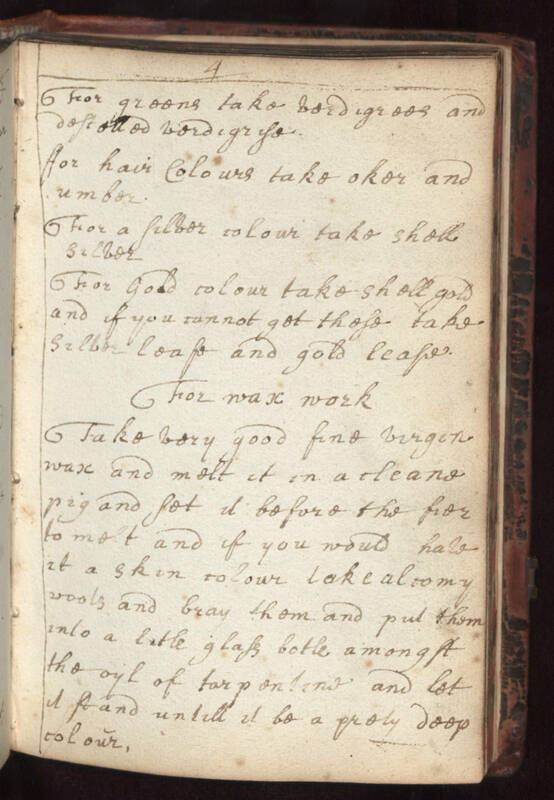 For greens take verdigrees and destelled verdigrise For hair colours take oker and umber. For a silver colour take shell silver For gold colour take shell gold and if you cannot get these take silver leafe and gold leafe. For wax work Take very good fine virgin wax and melt it in a cleane pig and set it before the fier to melt and if you would have it a skin colour take alcomy wools and bray them and put them into a litle glass botle amongst the oyl of tarpentine and let it stand untill it be a prety deep colour.